Stewart Stevenson, SNP MSP for Banffshire & Buchan Coast has today welcomed the news that a local community group are to receive Awards for All Scotland funding, totalling £1844. The Scottish Surfing Federation will purchase equipment to be use at surfing competitions held throughout the year. Awards for All Scotland is supported by the Creative Scotland, Sportscotland and the Big Lottery Fund and awards grants of between £500 and £10,000 to projects which promote education, the environment and health in the local community. Mr. Stevenson has written to congratulate Fraserburgh resident William Watson, Scottish Surfing Federation president, who was successful in the application and is hopeful that this funding will support them, and allow them to develop their activities in the local community. “I am delighted to see local groups, who are centres of activity in our community receiving these funds, which will serve to support them now and provide for their development in the future. Surfing is increasing in popularity and attracts a growing number of people to our coastal communities. Banffshire & Buchan Coast MSP Stewart Stevenson visited Anna Ritchie School in Peterhead on Friday to present the school with a Green Flag Award. 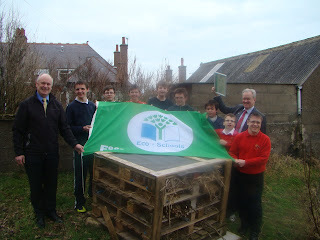 Green Flag Awards are made by Eco-Schools Scotland and this is the second such award gained by Anna Ritchie School. “It was a pleasure to visit Anna Ritchie School and meet the pupils from the Eco-Committee. “I was very interested to hear from the pupils what they have been doing as part of their environmental activities and they are very much to be commended for the range of activities they have undertaken, from litter picking in their community to building bird tables and nesting boxes. Buckie’s elected representatives have welcomed the opening of the new police office in the town, which sees Grampian Police moving from South West Street to Moray House in East Cathcart Street. “The investment by Grampian Police in new police facilities for Buckie is very welcome and demonstrates a strong commitment to local policing. In Government in Scotland the SNP has worked hard to ensure that frontline police numbers have increased and that the levels remain high. As a result crime is at its lowest level in decades and I know from my own mailbag that there are fewer issues being raised about criminality in our local communities. “Driving down crime and keeping our communities safe is always a top priority of constituents and that requires investment in both frontline policing and in the buildings and equipment required to support that frontline work. “The new police station was sorely needed, as their old facility was no longer fit for purpose for modern-day policing. Local MSP Stewart Stevenson has highlighted statistics demonstrating the damaging impact that tuition fees have on college students south of the border. Labours’ failure to back a motion supporting free tuition last week at Holyrood has cemented its position on their determination to re-introduce fees in Scotland. The huge charges faced by further education college students south of the border have been described as one of the most damaging measures imaginable. According to figures from the Office for Fair Access, the average student fee at Further Education Colleges south of the border in 2013/14 will be an estimated £6,211. Colleges wishing to charge more than basic level tuition fees must have an Access Agreement approved by the Office for Fair Access. For Further Education Colleges with Access Agreements, the average student fee for a full-time student in 2013/14 is estimated to be £6,489 – up from £6,352 in the current year. The figures make a mockery of Labour attacking the SNP Government’s commitment to free education, with hundreds of thousands of college students in Scotland currently being supported in their studies by the absence of tuition fees. “Imposing thousands of pounds of debt on college students is one of the most damaging measures imaginable, and can only have the effect of removing opportunity from thousands of young people in Scotland. “Labour politicians have been very keen to parade themselves as champions of colleges, but if that’s the case why do they want to hit college students with a bill for thousands of pounds in tuition fees? “Students in Scotland are appalled at Labour’s betrayal of them and no wonder – but although they no longer back free tuition they have not told us what they would introduce. “It is hard to think of any measure that could do more to undermine the college sector at a single stroke, and a look south of the border makes all too clear what the scale of the damage would be. “As has been made all too clear again this week, it is only the SNP that is truly committed to the principle of education based on the ability to learn, not the ability to pay. Stewart Stevenson, SNP MSP for Banffshire & Buchan Coast, has tabled a Motion in the Scottish Parliament commending the Scottish fishing industry for their development of novel trawls that reduce discards of white fish, including cod, allowing for more fishing days for those vessels equipped with the new nets. Working in partnership with the Scottish Government, the new designs of prawn trawl have achieved reductions of over 60% of cod caught when compared to a standard trawl, with one of the designs having the ability to reduce the cod by-catch by 87%. Trials conducted by the Scottish Fishermen’s Federation have also shown that the new trawls can achieve a 67% reduction in haddock and 64% fall in whiting, as well as achieving the required reductions in the cod catch. The initial spur for the development of these trawls was a means of allowing increased fishing days for the fleet. In a deal brokered by the Scottish and UK Governments, boats that use these new nets are able to ‘win’ back extra fishing days. “I am glad to hear that the Scottish fishing industry has taken steps to improve their prawn trawls to catch fewer whitefish. I welcome the advance in the efforts to conserve cod and the associated increase in the number of days the vessels using the new trawls can go to sea. That the Parliament commends the Scottish fishing industry on the development of innovative prawn trawls which significantly reduce discards of white fish, especially cod; understands that several new designs of nets have been created; welcomes that the 60% reduction in the number of cod caught will allow vessels using the nets more fishing days under European Union rules; recognizes that one design reduced cod by-catch by 87% and that additional designs continue to be developed. Banffshire & Buchan Coast MSP Stewart Stevenson has welcomed the 3.3 per cent funding rise for frontline healthcare announced by the Scottish Government, and has applauded their commitment to protecting health spending. All health boards are to share £9.1 billion in revenue funding in 2013-14, with Grampian receiving £743.8 million in Initial Funding Allocation. Funding for territorial health boards will increase by a further 3.1 per cent in 2014-15, again a real terms increase. Over £525 million will also be invested in improving NHS buildings and equipment. “We are committed to protecting spending on health, and this budget reflects a real funding increase for territorial health boards across Scotland. “Despite a difficult economic climate, we know how important it is that we continue to invest in our NHS – that is why we have protected health spending so we can continue to deliver a first class service to patients across the country. “It is right that, despite protected budgets, the NHS is as efficient as possible with taxpayer’s money. “This increased investment in the NHS will greatly benefit those served by NHS Grampian, who work tirelessly to improve the health of people in the North-east and beyond, providing high quality services and helping people make healthy choices. Local MSP Stewart Stevenson has welcomed the announcement from Fisheries Secretary Richard Lochhead that Peterhead Port will benefit from Scottish Government support of £¼million towards the cost of recovery works from December’s storms. The storms, which were caused by an unusual combination of south easterly gales, low pressures and high tides, were described as the worst in decades and caused damage across Scotland. The funding will be used towards the costs to repair harbours, sea walls, and quaysides to ensure fisheries harbours remained operational. “When I, and other Scottish Ministers, visited harbours around Scotland in the aftermath of the recent storms, the extent of the damage which had been caused was clearly evident. However what was also evident was the reaction of those affected and the sense of community spirit on show in the clean up work. “The harbour is the heart of the Peterhead economy and many of the area’s businesses rely on the activity there either directly or indirectly for providing jobs. The emergency harbour scheme fund is £400,000 per annum. An additional £1 million has been added to ensure enough funding is available following the unprecedented storm damage that occurred in December 2012. Additional work is continuing in respect of Fraserburgh (Trust) harbour to identify damage and costs. The emergency harbour scheme takes its powers from the 1955 Fisheries Act and as such is limited to supporting the environs of harbours where fishing activity takes place. In a number of cases insurers are funding the costs of repairs and replacement and the funds is contributing where funding gaps have been identified. Banffshire & Buchan Coast MSP Stewart Stevenson has welcomed the announcement of a £50,000 funding award for the Royal Scottish Agricultural Benevolent Institution (RSABI) by the First Minister. The First Minister announced the grant of £50,000 to be given to RSABI whilst speaking at a National Farmers Union Scotland event, which celebrates its centenary this year. The grant funding will be administered through the RSABI, a registered Scottish charity which helps to relieve hardship and poverty amongst people who have depended on the land for their livelihoods. It is expected the funding will help farmers and those working on the land by providing assistance to those individuals who find themselves facing personal difficulties. “The Royal Scottish Agricultural Benevolent Institution is a well-respected organisation which has a long and proud record of offering assistance to those who make their living from the land when times are hard. "I am delighted to support Scottish farmers and those who work on the land in Scotland. Recent figures show that Scottish food and drink exports have increased by more than 50 per cent since 2007, to more than £5 billion. I recognise that the most important element in this success is the quality of the product that Scotland is able to market and this quality comes as a direct result of the skill, expertise and commitment of farmers and individuals across Scotland. "Relying upon the land for your living is no easy task and I know that for some individuals the past year hasn't been easy due to circumstances outwith their control. Therefore I am pleased to announce a grant of £50,000 to be given to RSABI to help those who work on the land who have had to suffer misfortune and hardships over these past few years. "Agriculture continues to be vital to the health, well-being and prosperity of Scotland and NFUS continues to be crucial to the success of agriculture. I would like to take this opportunity to congratulate the NFUS on its centenary and for doing a fantastic job in supporting Scottish Farmers." "We are absolutely delighted that the Scottish Government recognises the plight faced by many of Scotland's farmers after the atrocious weather they have experienced over the past 12 months. Every day we are speaking to farmers who are facing difficulties, both on the farm and in their households. They are asking if we can help. This funding will enable RSABI to put more financial support into the homes of these farmers to help themselves and their families keep going until better conditions prevail. I would encourage any farmers who feel they are in crisis to get in touch with the charity to find out how we can help." Banffshire & Buchan Coast MSP Stewart Stevenson met with members of Deveron Care Concern in Banff on Friday to discuss current issues affecting carers. Deveron Care Concern is a group of local people campaigning and advocating the improvement of the standard of care for all those in the care system, particularly the elderly. “This was a very useful meeting to hear at first hand from the members of Deveron Care Concern of their views and thoughts on the care sector. Banffshire & Buchan Coast MSP Stewart Stevenson has marked the 60th anniversary of the Fraserburgh Lifeboat Disaster by tabling a Motion in Parliament. “Last year saw the RNLI reach a milestone with the 140,000th life saved by lifeboat crews and it so happened that it was the Fraserburgh crew who carried it out. “2013 sees another, more sombre but no less important, milestone with the 60th anniversary of the 1953 Fraserburgh Lifeboat Disaster where six crew members lost their lives in the service of assisting others. Banffshire & Buchan Coast MSP Stewart Stevenson has given his backing to Scottish Tourism Week. Scottish Tourism Week, which runs from 4 March to 13 March, is a focused week of activity aimed to increase awareness of the vital contribution Scottish tourism makes to the Scottish economy. Scottish Tourism Week brings together the private, public and elected sector with a shared positive agenda, to remove barriers and create opportunities together to meet the economic battles that lie ahead. In 2010, 14.7 million tourists visited Scotland, injecting £4.1 billion into the economy. Tourism is a pillar of the economy in the North-east, aiding employment in the area. Local attractions such as the Whisky Trail and the Castle Trail play a crucial role in bringing tourism and their attendant economic benefits to Banffshire and Aberdeenshire. “I believe in the cause of Scottish Tourism Week, which is devoted to raising awareness of the critical role tourism plays in the Scottish economy. The tourism industry and events such as the Cornhill Highland Games, Peterhead Scottish Week and the Scottish Traditional Boat Festival provide a substantial boost to the North-east’s economy and it is growing all the time. For more information please visit http://scottishtourismalliance.co.uk/. Cruden Bay, Hatton & Longhaven and Peterhead SNP branches held their 2013 Burns Supper in the Public Hall, Longhaven. The Burns Supper, which attracted over 60 guests, heard speeches from locals and visitors, including an Immortal Memory by Skye, Badenoch & Lochaber MSP Dave Thompson, a Toast to Scotland by local MP Eilidh Whiteford, with some recitations from Peterhead Burns enthusiast Kevin Lamb. The haggis was carried in by George Anderson accompanied by piper Daniel Hutchison, with the Address to the Haggis being made by Ellon councillor Richard Thomson. Musical entertainment was provided by John and Liz Slaven of ‘Ficherin Aboot’. “This year’s Burns Supper featured fantastic contributions from some very high calibre speakers and some amazing local musical talent, who I would commend to anyone for a good night’s entertainment. "I was delighted that we had such a great turnout at this year’s event. It was a great night with everyone in a very bouyant mood ahead of the referendum in 2014. The speakers and entertainers were top notch. All round it was a great way to celebrate our national bard. “Thanks must go to everyone that took part in and helped organise a very enjoyable event."